How Do I Hit Fairway Woods? Fairway woods are helpful for long golf shots on par 5 holes. Fairway woods are useful alternatives to the bulky drivers that many players find difficult to hit. They are used by low and high handicappers alike to keep the ball straight and still achieve nearly the same distance as a driver. Fairway woods call for different hitting techniques, however. The proper techniques for hitting fairway woods often resemble those used with your longer irons, whether you are on the tee or the fairway. Tee the ball up around a half inch, or just off of the ground, when hitting off of a tee. You should be able to place the club behind the ball on the tee and see the ball in the middle of the club face. Take a longer back swing than you would with your irons, because the club is among the longest in the bag. A longer back swing will allow you more time to swing the larger and heavier club through the hitter zone. Position the ball in the middle or back middle of your stance, so that you hit the ball when the club is descending, to produce a longer and more lofted flight. Snap your wrists more quickly at the bottom of the swing. Because the club is longer and the head is heavier, you may not be accustomed to getting the club around as quickly as you should, so you can compromise by snapping your wrists more quickly. 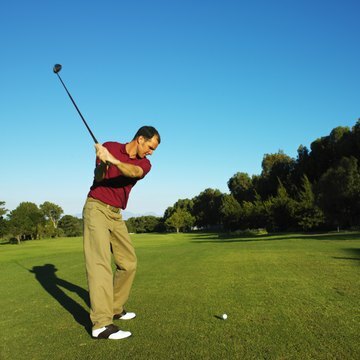 Hit the ball first on your descending swing and create a divot right in front of the ball. Just as you would with your irons, the correct swing has ball contact followed by contact with the fairway.